This is a great quirky book written by Matt Smith. 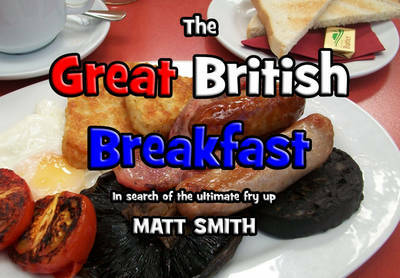 Join him as he aims to find the ultimate fry-up experience (mainly in the East of England). From supermarkets to pubs and farm shops he tries out many of the places that serve up an all-day-breakfast. Who does the best breakfast? I’d say that the best fry-up I’ve had is from a place called the Gorge Cafe in Reading. There’s a large number of festival goers, bikers and so on that would agree with me on this point I think. Vale Cafe : A46 Cheltenham Road, WR11 7QP : They serve the most Wonderful Breakfasts, Try either The Traditional, The Light, The Big, The Vegetarian or The 10oz Gammon Breakfast, fabulous free range eggs if you are a Poached Egg Person. Items used in the Breakfasts : (R/L Best Back Bacon or Smoked Bacon, Pork Sausages, Free Range Eggs, Baked Beans, Fresh or Tinned Tomatoes, Hash Browns, Sauté Potatoes, Fresh Mushrooms, Black Pudding, Fried Bread, Toast. tried and tested all with the conclusion each breakfast will suit any persons taste on each visit. Ever since I came to Britian, I loved the British fry up. Sadly it is on the decline. I cant even get a decent butchers around my area, its all Halal. I am not even going to try and ask if they could do me a couple of rounds of bacon and pork related food. The one poor butcher we had got threatened that if he didnt sell Halal meat, and stop selling pork some harm would come onto him. Well he sold up. I have to travel several miles, as the supermarkets will not sell pork produce, even Bacon crisps. I have also seen a decline in the number of pubs that do all day full English breakfasts, its now Chickn curry, and curry night is ubiquitous everywhere, that and quiz night. Sad sad day. One of the best things England did was a fry up, even that is being lost. The Guys Went to the Vale Cafe on the A46 Cheltenham Road,WR11 7QP as reccomended by a friend who goes most weeks and tried the Sausage Breakfast, not kidding you we had the : Original Old Gloucester Spot Sausage Breakfast which included 2 Large Old Spot Sausages, Hash Brown, Saute Potatoes, free range egg, fresh mushrooms, grilled tomato, black pudding, fried slice and buttered toast, it was well worth the visit,Coffee was bean to cup which again was first rate, can’t wait for my next drive by, so many breakfast to choose from, Give the place a GO ! !